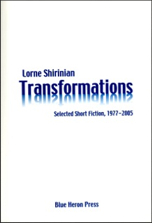 In Transformations, Lorne Shirinian revisits 29 stories as well as prologues and prefaces selected from five collections of his fiction written over a 28-year period. Many have been edited and revised. Based on the idea that art is never completed but abandoned. Shirinian writes, "We age, we mature, and bring that experience to the reconsideration of the story."